This is one in an ongoing streak of posts everyday through May to raise awareness about pediatric stroke. If you’re able, please contribute to my fundraising efforts. This vision statement below is also something I had to write to prepare for Mia’s Individualized Education Program (IEP) meeting on Friday. I’ve been writing this kind of statement at least once a year since Mia was an infant. Before she turned three, she had Individualized Family Service Plan (IFSP) meetings and documents. 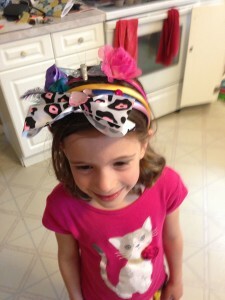 Now that she’s three, she has an IEP. Last spring, I was very anxious as we approached her first IEP meeting. When she was receiving Early Intervention services from about 1 month until 3 years, she qualified simply due to her diagnosis. They have a list of diagnoses that automatically qualify and stroke is on it. Every six months, they would adjust her services based on her developmental needs but there was never a question of her not qualifying. The Early Intervention program is pretty warm and fuzzy, at least in our experience. They made house calls to visit Mia at home or daycare, and the support is for the whole family. We didn’t need many of the supports they could have offered but I felt glad knowing that if someone needed help with transportation or interpreting what doctors were saying, they’d do all that. The rules change once kids turn three. Services are only approved if a child’s impairment limits their ability to learn in school. I educated myself by attending a couple of workshops run by Federation for Children with Special Needs. These workshops scared me. The parents who teach these workshops have become advocates and teachers because of really awful situations where services were denied. I feared a very adversarial first IEP meeting. I took our former physical therapist with me to that meeting. The meeting was fine. The public preschool occupational therapist said Mia barely qualified. The public preschool physical therapist said she didn’t qualify. That was fine with me as I wanted Mia to have occupational therapy but not physical therapy. I requested that Mia get to work directly with the occupational therapist instead of the occupational therapist assistant. I also requested an 8 am time slot. All of my very reasonable requests were honored and we have been working with the same therapist since September. She’s told me that she plans to recommend Mia continue occupational therapy one more year so I’m not particularly nervous for Friday. Mia is happy, curious, motivated, has good attention, perseveres, has strong problem solving skills, and is very empathetic. Mia loves books, climbing, jumping, running, riding her bike, doing the monkey bars, talking, singing, puzzles, arts and crafts, playing with her sister and her friends. Given Mia’s medical history and limited functional use of her right arm and hand for fine motor tasks, I am concerned primarily with optimizing her dexterity for an increasing range of tasks of daily living and learning. I am concerned about both fine motor skills needed for academic tasks like coloring and writing and skills needed for independence in manipulating the objects in her daily life like clothing and food containers so she can be as independent as her peers with toileting, managing her snack and lunch, and helping in the classroom. I expect Mia to adapt to her new preschool classroom (transitioning in June) and fully participate in all classroom activities developing socially, emotionally, physically, and cognitively as appropriate for a 4 year old. In terms of Mia’s functional use of her right hand and arm, my goal is that Mia gains control and dexterity to do increasingly complex functional tasks that require her to relax excess tone, supinate her arm, and use differentiated movements of her thumb and fingers. I believe that strength and dexterity support each other. 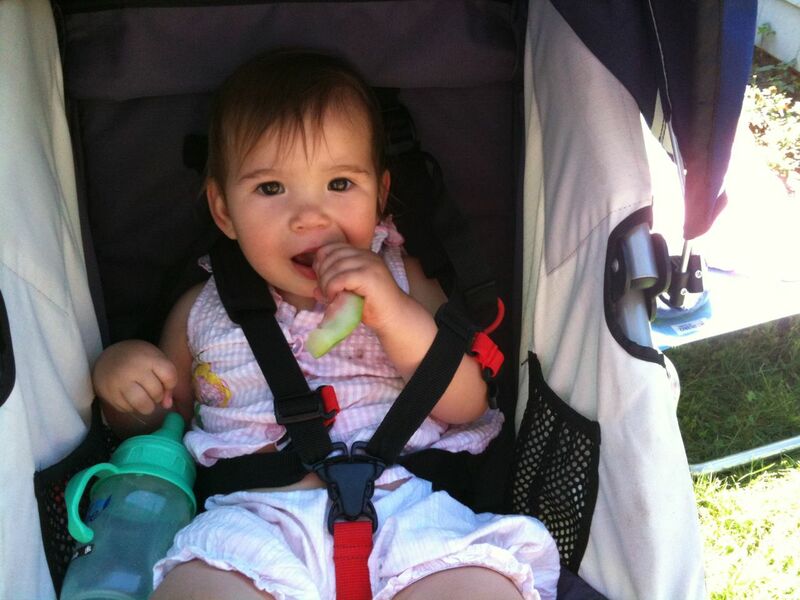 As Mia can do more, she will gain strength, which will support her further development. Over the next three to five years, I expect Mia to enter elementary school with her peers, capable of mastering the independent skills of learning and the life of the school needed to thrive in her early elementary years. This entry was posted in Pediatric Stroke Awareness Month 2013 and tagged IEP, IFSP, Mara, Mia, occupational therapy, physical therapy on May 21, 2013 by mara. We have a lot of potty talk around here. At dinner tonight, it started as the game of telephone where each person was supposed to keep the same first word and change the rest. The variants ran along these lines, “Poopy, patter, paw, paw!” And so it goes. I let the potty talk go on freely, hoping it will help everyone feel less inhibited with the actual act. Humor is essential here as it’s a mighty serious subject and without some levity, I would have lost my mind a long time ago. This may be the hardest aspect so far in parenting Mia through her recovery from her stroke. It may be too much information for some of you but I am sharing it so it’s not such a taboo subject as I think that just makes it that much harder. First the facts. Both of my girls struggled some with constipation as older infants and toddlers. Zoe learned relatively early to use the potty for both pee and poop, well before age 2.5. And, at around 2 years 8 months, she complained that the night time pullups were giving her a rash and went cold turkey. Things with Mia have taken a different path. Her constipation was a bit more intractable. I asked her neurologists about it when she was 2. They denied any relationship between her stroke and digestive issues. This is interesting because among the families on the Hemi-Kids mailing list and Facebook group it is a frequent issue for kids who have had neurological injury early in life. Conventional treatment is to use Miralax but that’s not actually been demonstrated to be safe for children for years on end which is how it’s often used. I was uncomfortable going that route. So, as usual, I researched and experimented until I found my own way. Last February when Mia was 2 years 8 months old, we were on vacation and she hadn’t pooped in a few days. When she finally did, we completely changed her diet to cut out most grains and dairy. She went 4 days in a row and spontaneously started to ask to pee on the potty. At the time, I thought this was our breakthrough and we’d be doing the elimination diet for a week or two more and then slowly reintroducing foods to figure out which ones to avoid. Here we are more than a year later. The elimination diet was not the magic bullet. We tried an even more strict version of it with everything homemade from whole foods, absolutely no packaged or processed foods at all for a month. Try that. Completely impractical for me as a working single mom. We introduced probiotics. I started buying raw milk and fermenting my own kefir to make smoothies every morning. And, we started a behavior-based program called Soiling Solutions last June. It’s essentially a program to help Mia poop every single day. Thankfully, our new pediatrician is on board with this approach. At least she was last year when I shared a letter with her explaining it. We’ll see what she says at Mia’s four year well visit. We schedule our “poopy time” to be right after dinner. The program consists of up to four rounds of this routine – sit on potty for 3 minutes, relax and play elsewhere for 10-12 minutes, repeat. On the best days, she goes on her own before the designated time. On the worst days, it takes an hour including a gentle inducer (glycerin suppository) after the second unsuccessful sit and occasionally a more harsh inducer (saline enema) after the fourth sit if she still hasn’t produced. When we started this last June, it was pure torture for Mia, me, and Zoe. Zoe became the hero because in the early days we were having to do the full routine almost every day and since I was bad cop, Mia needed Zoe to comfort her. Now, it’s almost Pavlovian. We use kitchen timers for the 3 minute part and the 10 minute part. The girls watch a show on Netflix Instant in between the sits and Mia likes to pause the TV when she goes to sit. She still asks for Zoe to sing or hum to her if we have to do “bum bum blastoff” which is the name they coined for the suppository because it looks like a rocket ship, of course. Even this protocol has not completely resolved the issues but it does ensure that Mia goes every day and that means she can be in underwear at school and all day, staying clean and dry which is hugely important for her self esteem. She goes more often on her own initiation than she used to and I keep hoping that soon she’ll figure out she can go on her own all the time. But, in the meantime, we have a strict routine that we follow 6 nights a week. The one night I am out for the evening, our au pair asks Mia to sit and she occasionally poops for her. But, more often, she skips a day and then spontaneously initiates on her own sometime the following afternoon. We’re gluten-free at home and a bit more flexible when out and about, but still really careful. I still make kefir from raw milk and send smoothies with Mia each morning. Zoe has a love hate relationship with these smoothies. I like them. Mia has special gluten-free treats in the freezer at preschool so she can have something at times when others bring in birthday cupcakes. Her teacher checks with me regarding ingredients if they are doing a class baking project or taste test. This entry was posted in Pediatric Stroke Awareness Month 2013 and tagged Mara, Mia, poop, potty, stroke, Zoe on May 20, 2013 by mara. Continuing my writing and fundraising Streak for Mia, I am going to attempt to share something that’s tougher for us right now. 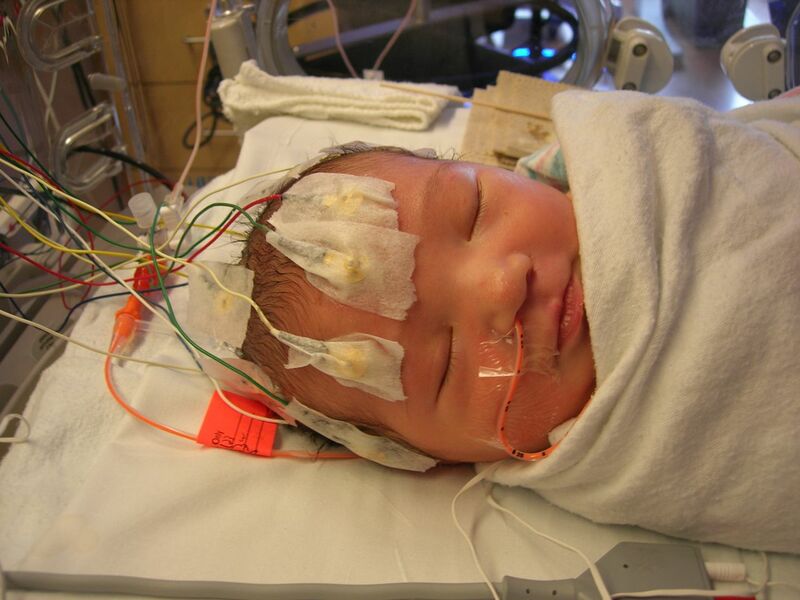 Zoe was nearly two-and-a-half when her world was changed by the birth of Mia. She had my full attention for all that time. It can be hard for older kids to adjust to a new member of the family under ordinary circumstances. But, the days, weeks, months, and years since Mia’s birth have been a little out of the ordinary, with a crisis time around when Mia was diagnosed and then a lot of ongoing extra needs that have consumed my time and energy. Zoe notices. It’d be hard for her not to notice. Zoe is 6 now. Here she is this morning at our CSA farm where we spent the morning working and playing. 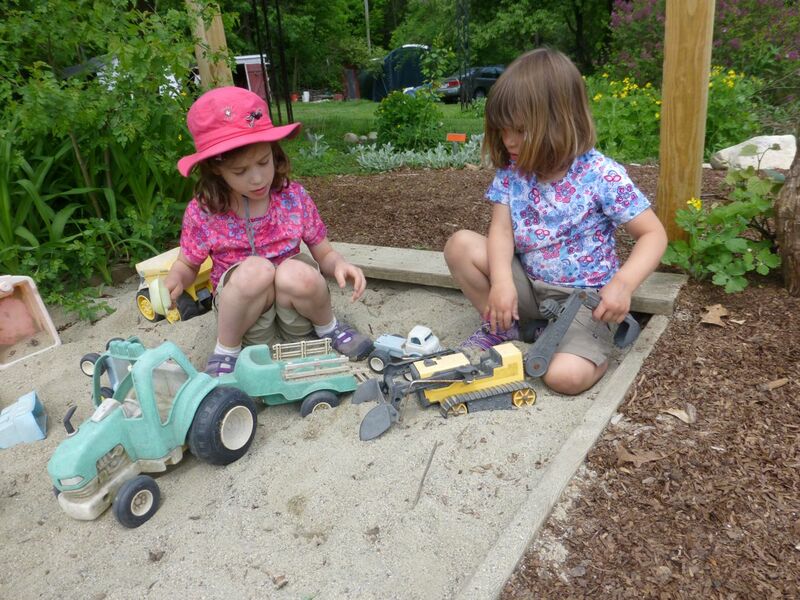 Zoe and Mia got to spend a couple hours in the Children’s Garden while I helped plant and weed in the flower beds. Zoe is delightful, smart, funny, very intense, and rather competitive. She is quite agile, loves art, is comfortably speaking Spanish at school and with our au pair, and has a phenomenal attention span for chapter books. The reading streak that Zoe and I have going is now on day 234! Mia sometimes joins us but it’s Zoe who is the one asking for and choosing book after book, requesting chapter after chapter. It’s the one sustained thing that she and I have together that feels very connecting for her. She’s had a challenging time at school for the past 5 months of Kindergarten and just got a new teacher two weeks ago so we’re in a stressful transition time, working toward a positive end to the school year. I’ve been struggling since January to make sense of her difficulties at school. I have had many theories and done many experiments to try to help. The latest one seems like it may be closer to the root. Clearly, there have been classroom issues or they wouldn’t have abruptly changed the teacher with just seven weeks left in the school year. But, now that I know the kind of behavioral challenges Zoe is having at school, I see many of them seem to be related to the world not being fair. It’s not. Last night, I started to talk with Zoe in more detail about what happened when Mia was born and in the NICU and how that might have felt to Zoe. We talked about all of Mia’s appointments and all the extra time she gets with me because of her stroke. Zoe was engaged, attentive, and at times upset and angry. She also had new insight when she told me, “I’m lucky.” I asked her why and she explained that she only has one thing wrong with her, big tonsils. She doesn’t like it when the doctors say she has big tonsils, she feels self-conscious about it. She asked me just last Saturday on the way to the doctor how many doctors she has compared to Mia, and she told me that Mia has had two problems – her ears and her right hand. I helped her reframe to focus on Mia’s stroke. Mia was in the car. After our talk last night, I glanced at Facebook and Zoe was still with me. She saw a picture of a boy with some kind of bandage or cap covering his head and asked about it. I explained that boy had just had a hemispherectomy, a procedure to take out part of his brain so he wouldn’t have seizures any more. She had lots of questions and more empathy than usual. We talked about how that boy may have a sister or brother who might have feelings too. She got it. I hope we’re making progress. It’s true, life is not fair. At every age and stage, Zoe is a bit older, a bit ahead on her ability to ask questions and that’s pushing me to figure out the language to use in front of Mia and Zoe to help them both feel whole, well, and fully part of our little family. 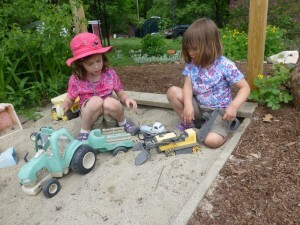 Here they are, in the Children’s Garden sandbox, playing nicely together. 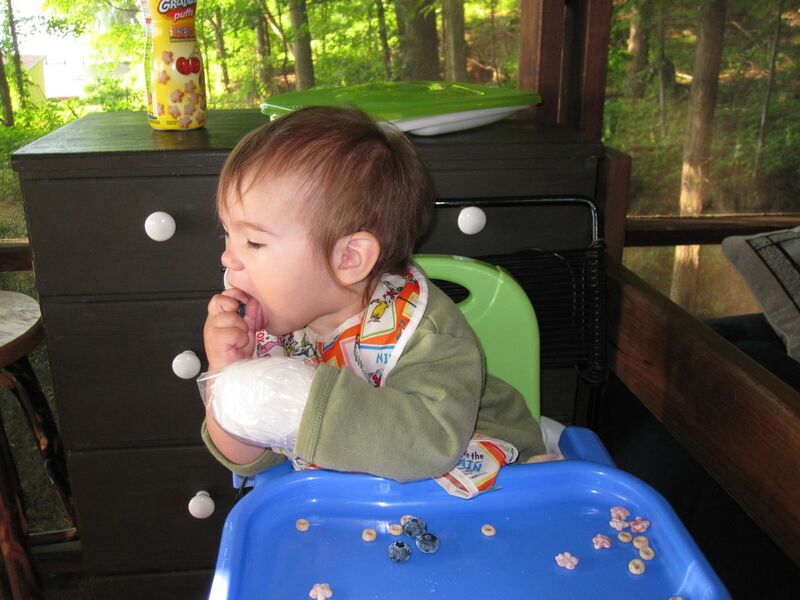 This entry was posted in Pediatric Stroke Awareness Month 2013 and tagged au pair, Mara, Mia, reading streak, stroke, Zoe on May 18, 2013 by mara. First some news. My Streak for Mia is raising awareness about pediatric stroke, raising money for Children’s Hemiplegia and Stroke Association, and giving me a chance to share our story with friends and family and others who can learn from our experiences. All that’s been very rewarding to me. I enjoy writing for a purpose and feel gratitude that my efforts are being recognized in many ways. I was honored to be invited to be a guest blogger for the www.chasa.org blog. Thanks to generous donors including many of my coworkers, my fundraising total is up to $2560 including an anticipated match by my employer. Thank you for reading and for supporting us! Mia had her weekly session of occupational therapy this morning. I had suggested she put on a sweatshirt. She found one and was working on zipping it all by herself. Then, she asked for her favorite vest which has a zipper that she has completely mastered. I got the vest and another on the same hanger. All of a sudden, Mia appeared beaming because she had zipped the sweatshirt and both vests! We managed to get out of the house after some typical weekday morning craziness for the 8 am appointment. 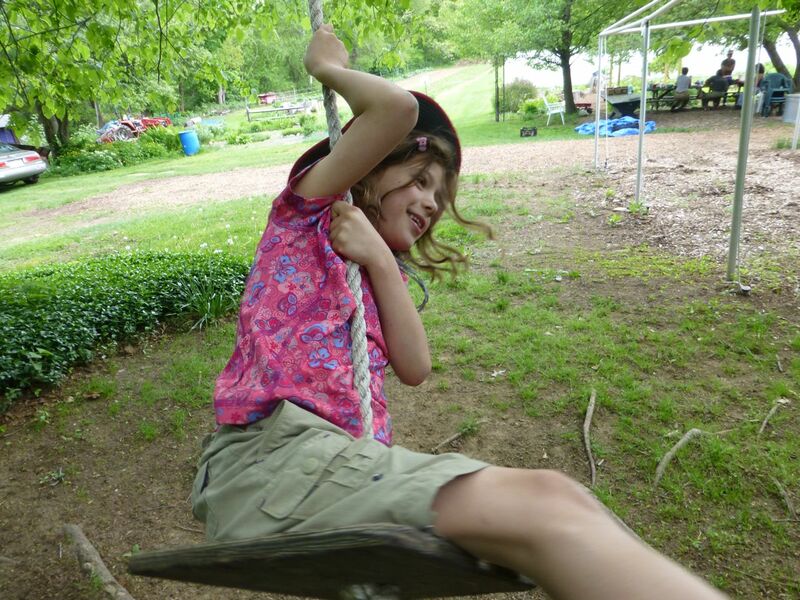 I hesitate to share all of Mia’s accomplishments with her therapist for reasons that have nothing to do with her therapist and everything to do with how services are determined for children with special needs in Massachusetts. I did show her a video of Mia riding her bike last week. 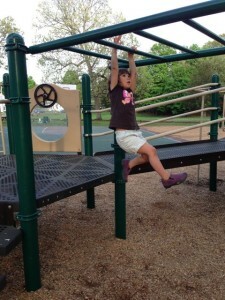 I was wanting to share the pictures of Mia on the monkey bars. And, with Mia’s permission, I wanted to tell her that Mia had zipped all three zippers herself this morning. But, I didn’t want to tell her these things if it would jeopardize Mia’s chances of continuing to receive occupational therapy for another year. Last week, the therapist said she goes back and forth on what to recommend but she plans to suggest we continue another year. Mia’s pride and mine were too strong not to share this morning so we told the story about the zippers, and we showed pictures and videos of the monkey bar adventures. She had tears in her eyes with joy to see what Mia can do on her own. They went off together for the half hour therapy session. Last fall, I had advocated to be allowed to join in for the last 10 minutes to see what they were doing and learn some things to do at home but since the Newtown shootings that’s no longer permitted. So, I get a brief update in the school entryway after Mia’s session about what they did. Today, the occupational therapist shared this awesome picture. 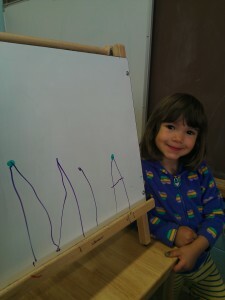 Mia had tried to write her name and she gets the letters kind of mixed up, upside down, backwards. So, this is a subsequent attempt with dots to help. Proud Mia, proud Mommy! This entry was posted in Pediatric Stroke Awareness Month 2013 and tagged handwriting, Mara, Mia, occupational therapy, stroke on May 17, 2013 by mara. 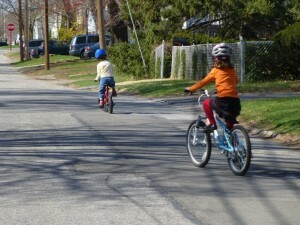 This post on bicycling is part of my streak in the month of May to spread awareness about pediatric stroke. Please consider donating to support Children’s Hemiplegia and Stroke Association, an organization that has helped our family tremendously with support and information. 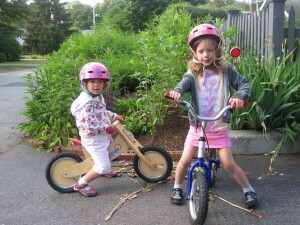 Both my girls started riding balance bikes (2 wheels, no pedals) when they were two years old. In late March, Zoe asked me to go to the bike store to look at bikes. She’d been outgrowing her 16″ bike which she rides well. I had raised the seat but then the handlebars were too low. Of course, Mia also chimed in with, “I want a new bike too!” That wasn’t part of my original plan. 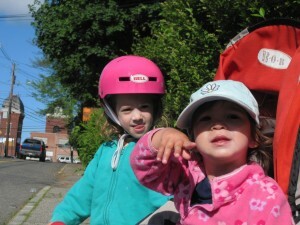 She was on track to stay on the balance bike a while longer and then get Zoe’s 16″ hand-me-down. For historical reference, Zoe could ride her Skuut balance bike the mile to their daycare before I got her the 16″ “pedal bike” which was in the spring after she turned 4. We skipped training wheels. The 16″ bike was a little too big. She could pedal right away and balance and steer but it took her a while to be able to start and stop with confidence and she went back and forth between the balance bike and the pedal bike for more than a year before things clicked on the pedal bike. On that shopping day, I ended up getting Zoe a 20″ bike with hand brakes and gears. It seems like she is a really big kid all of a sudden. She can ride it well and independently. I even let her go up and down the street by herself. She’s good about going to the side of the road when a car is coming. Mia fell in love with a little red 12″ pedal bike so I indulged her too. Mia could pedal, balance, and steer on day 1. She still needed help to get started over and over again, but she mastered her 12″ 2-wheeler faster than Zoe did the 16″ just because it’s more her size. Bicycling is an excellent skill and activity for Mia with her right-side challenges as it requires that she use her whole self in a balanced way. The grip on the handlebars and the pressure up through the arms is good for her. On her first day, she seemed to need to look at her feet to make sure they are on the pedals and some of that could be that she’s learning but some could be that she uses her eyes on the right foot particularly since her sensation is less developed there. I kept reminding her to look up at Zoe who was off in front most of the time. Here’s Mia after just three weeks on her new pedal bike. She can pedal, steer, turn around to come back, and stop in a controlled way. You may notice that she does let go first with her right hand when stopping at the end of this video. Since that video, she has taught herself how to start on her own, all before turning 4 in June! Balance bikes are awesome! 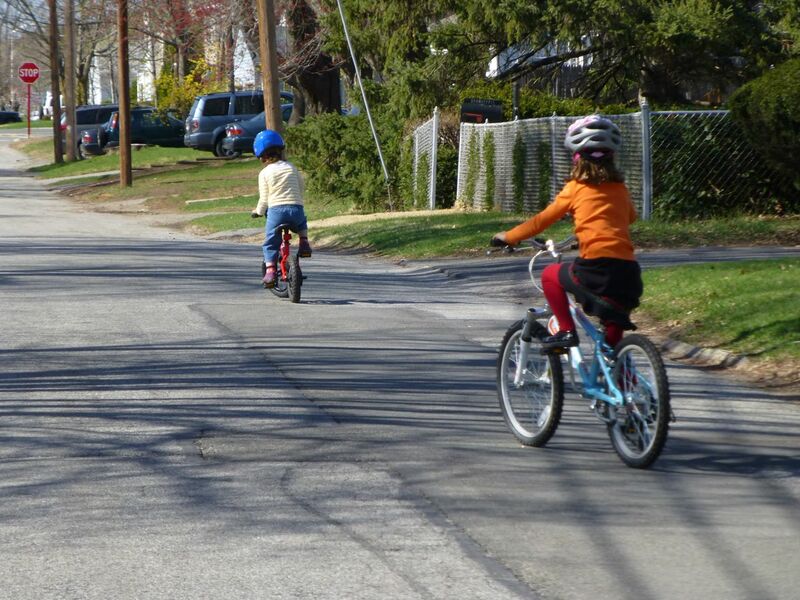 Kids learn to balance and steer and go fast without also dealing with pedals. It’s possible and faster to skip training wheels. The right size bike makes learning much easier. I don’t mind that Mia will outgrow her 12″ bike after a season if she has used that season to master the skills. 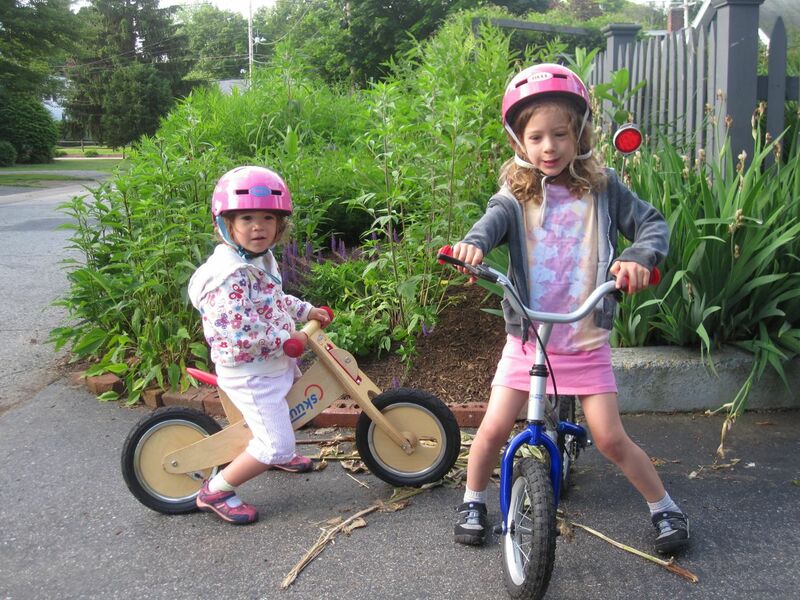 This entry was posted in Case Study, Pediatric Stroke Awareness Month 2013 and tagged bicycling, Mara, Mia, stroke, Zoe on May 16, 2013 by mara. This may be my longest post so far as part of my streak in the month of May to spread awareness about pediatric stroke. Please consider donating to support Children’s Hemiplegia and Stroke Association, an organization that has helped our family tremendously with support and information. When Mia was nearly 12 months old, her physical therapist suggested that a splint might help her right thumb abduct better. She tended to keep it tucked in next to her hand. With my Feldenkrais orientation, I was really opposed to any kind of stretching for Mia’s right hand, wrist, or arm. I didn’t want to splint her right arm. From what I knew, that would only cause her brain to work harder against the resistance of the splint. So began a research project that led me to Children’s Hemiplegia and Stroke Association (CHASA) which helped me discover Constraint Induced Movement Therapy (CIMT), and make my own conclusions about what to try with Mia. Here’s Mia on her first birthday, chewing on a watermelon rind that she’s holding with lefty. You can see that her right hand is in a fist and her right thumb is tucked in between her index finger and her middle finger. This was a common position for Mia at that age. When Mia was first diagnosed, I think I did find CHASA but I didn’t want to sign on to the support group there. I don’t know if it was because I was in shock, denial, or just didn’t want to fully identify with the group. I was doing everything I could to ensure Mia’s recovery. In any case, after a year, I was on a mission to avoid the recommended splint for righty, and needed to search the archives of posts of other families who were dealing with similar challenges, similar decisions. I found many discussions of splints for the affected hand and also for the unaffected hand in the context of CIMT. So what is it? Constraint Induced Movement Therapy is an approach where you restrict the movement of the unaffected hand and arm, usually through casting or splinting it, so the person is given the opportunity to learn to use the affected hand and arm, of necessity. Intensive therapy is given at the same time so progressively more challenging tasks can be mastered over a period of days or weeks. Often, significant improvement can be seen over an intensive period of a few weeks. This work was pioneered by Edward Taub in controversial research with monkeys but later accepted for adult stroke patients and more recently adapted for kids. I found all the articles I could on pediatric CIMT, took them with me on vacation, read The Brain That Changes Itself, and went to the pharmacy for self-adhesive ace bandages to use to fashion my own constraint for Mia who was just starting to walk but still crawling quite a lot. 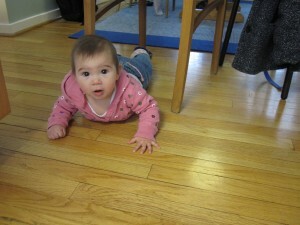 I wanted a constraint that limited her ability to use her left fingers but allowed her to crawl and pull to standing. I covered the bandage with a sock. Mia’s vacation was spent with her left hand and wrist in this constraint for all her waking hours except if we went swimming. She played on the beach like that, she ate like that, she seemed to adapt. Here she is at 12 months old, working hard to get a blueberry into her mouth. I had some tough conversations with family members and strangers. Everyone wanted to know why I was taking away her “good hand.” Strangers wanted to express empathy that my baby had broken her arm. But, then if I replied that she’d had a stroke, they were in shock. I was learning too, dancing between sharing our truth, and just getting on with helping Mia. In that week, Mia gained some skill with her grasping and releasing. I brought out new toys and fun finger foods. Food is highly motivating so if she was successful in eating with righty, she’d keep at it. Sometimes we took the wrap off because it was hot or annoying. 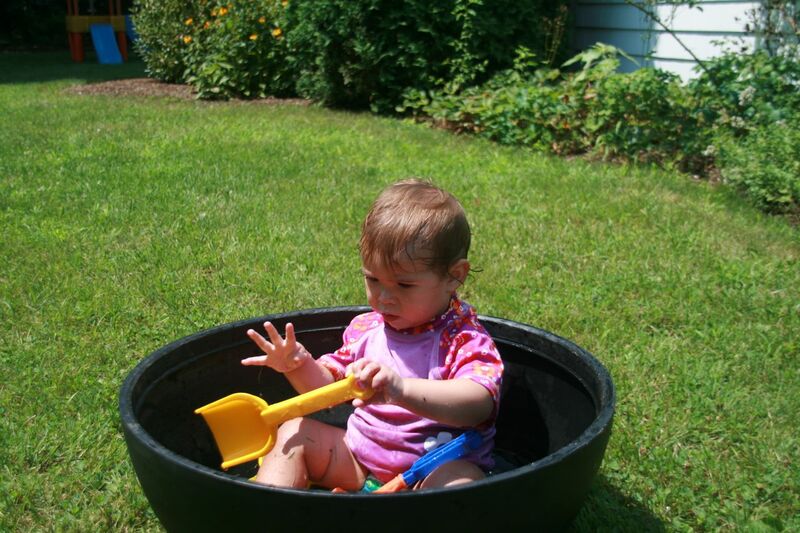 Mia started to spontaneously open her hand a lot more to do things like grab a sand shovel while playing in water. Over the next few months, I got more professional resources to help support our experiments. We saw a physiatrist, that is a doctor of rehabilitative medicine. She connected us with an occupational therapist who specialized in CIMT at Spaulding Rehabilitation Hospital. Another parent on the Hemi-Kids mailing list referred me to a fabulous orthotist who made a hot pink neoprene splint for Mia to wear on lefty. 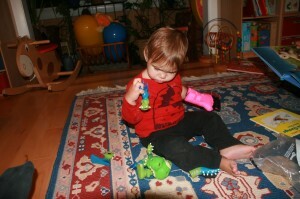 Here’s Mia playing with a magnetic monster with righty and sporting her new splint on lefty. She was 15 months old. Once we had that splint that was easy to put on and take off, we tried a new routine where the splint was just another thing that Mia had to put on each morning while getting dressed. She wore it from about 7 am until 10:30 am so she ate breakfast at home with righty and snack at daycare also with righty. I oriented her daycare teachers about good activities to do in the classroom – lots of sensory stuff like sand, rice, beans, water and shaving cream, puzzles, toys, balls. Mia could point well with her right index finger by the age of 2 years. The splints that Mia has had all stopped below the elbow so she could always do bimanual things too. That helped cut down on frustration. Mia eventually outgrew the pink splint and by then she was old enough to request her own color – green! By the time she was 2.5, she had developed both the ability to point and a decent pincer grasp. She had also developed the ability to take off her splint and she started to protest wearing it every day. So we stopped. By then, Mia could respond to verbal prompts to, “Give righty a turn.” Or, “Use both hands.” Or, “High five with righty!” Try asking most 2-year-olds to do something with righty or lefty and they won’t know what you’re talking about. 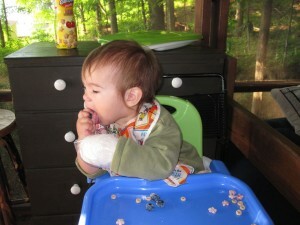 Typically, handedness doesn’t develop until age 3. Here’s a video of Mia working hard to do a puzzle, she’s practicing her pincer grasp and doing a nice palmar grasp and working on supinating too, that is to rotate her arm so her palm is up. 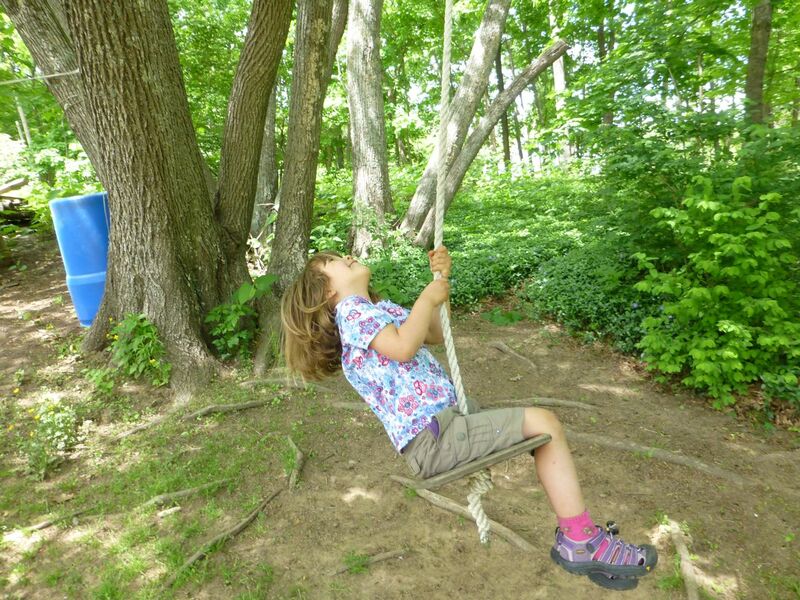 This entry was posted in Pediatric Stroke Awareness Month 2013 and tagged CHASA, CIMT, Constraint Induced Movement Therapy, Feldenkrais, lefty, Mara, Mia, righty, sensory, splint, stroke on May 15, 2013 by mara. It’s hard to find time to post every day. Right now my girls are taking a bath together splashing up the bathroom. I’m going to make it quick tonight with a photo celebration of their sisterhood. 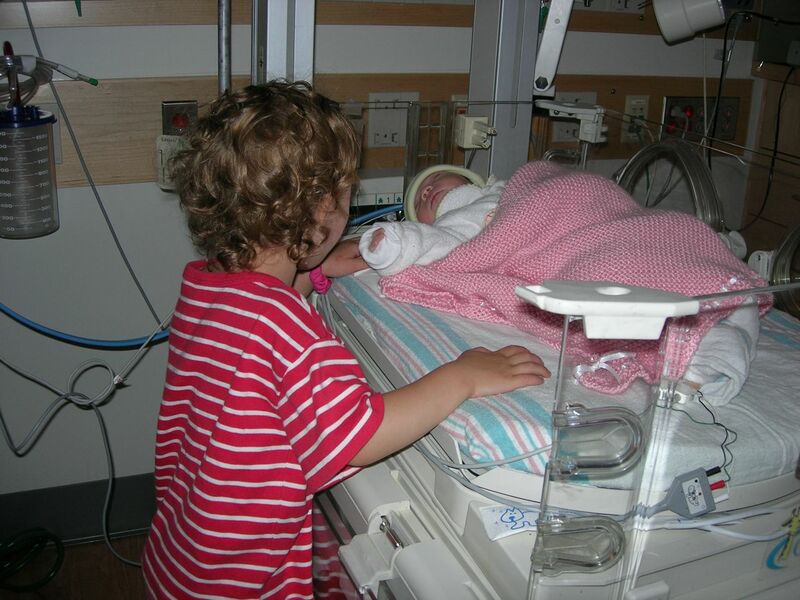 Here’s Zoe holding newborn Mia, before Mia showed any signs of seizures or stroke. 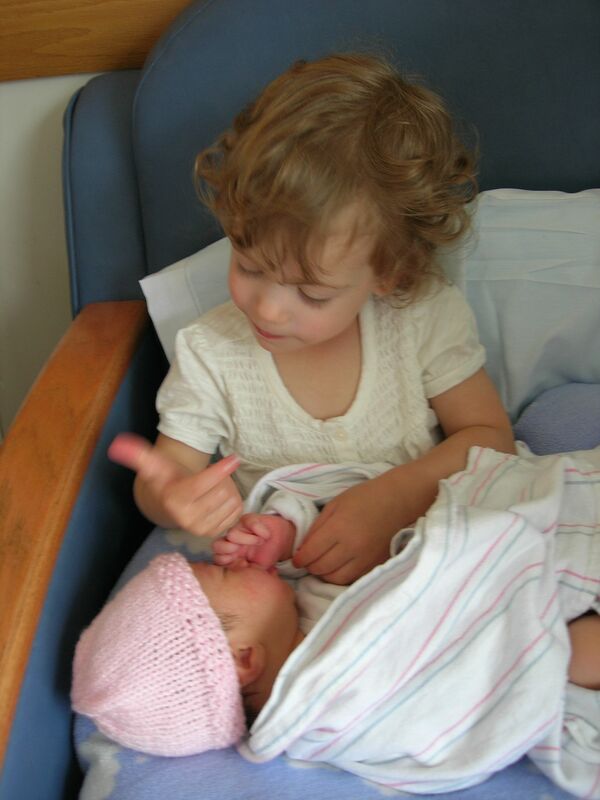 Mia is sucking her thumb and Zoe is studying hers as if to learn how. 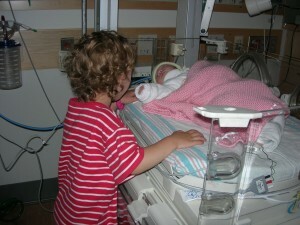 Zoe got to visit Mia in the NICU. Zoe and Mia both mastered their balance bikes. This is from August 2012. Zoe was 5.5 and Mia was 3. And, this spring, Mia has learned to ride her pedal bike. They both skipped training wheels and went right from balance bike to pedal bike. 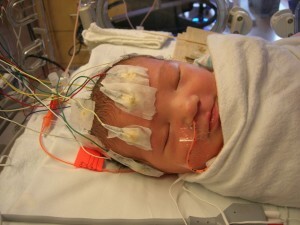 This post is part of my streak of posts in the month of May to spread awareness about pediatric stroke. Please consider donating to support Children’s Hemiplegia and Stroke Association, an organization that has helped our family tremendously with support and information. My employer will match donations from coworkers so your gift can be doubled. This entry was posted in Pediatric Stroke Awareness Month 2013 and tagged Mara, Mia, seizures, sisters, stroke, Zoe on May 14, 2013 by mara. This morning, my girls raced down to our au pair’s bedroom to gather their stash of cards for me. They brought them up to me and some flowers too! That was novel to receive flowers for Mother’s Day. Mia had made her card during her past two sessions of occupational therapy. Zoe made one card in art class and another on her own. 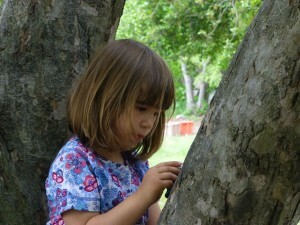 Zoe was recovering from strep throat, which sadly arrived on Friday night, so we had a kind of quiet morning. Zoe and Mia got crafty with some headbands and at one point, Zoe wanted to show me all of them and asked me to post the picture – so here she is in all her headband glory! 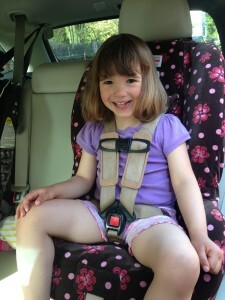 In the afternoon, we managed to get out of the house and Mia buckled herself into her carseat for the first time. She’s been doing the top buckle for a while. As I went to help her with the bottom buckles, as usual, I found her grinning with her own accomplishment, “Mommy, I did it all by myself!” I’m pretty excited about this milestone too. As Mia gets more and more independent, I find we are entering a new era where both girls can help quite a bit more and so some of the labor of mothering shifts. We ended the day with a brief visit to a small carnival that was set up near our house. 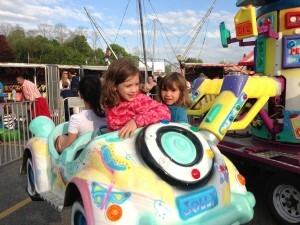 Here are the girls in the little car ride that they enjoyed twice. All three of us also got to go on the Ferris wheel twice. No pictures of that though as I couldn’t figure out how to take one without worrying about dropping the camera. After the carnival, Mia didn’t want my help with her buckles and she managed to get two of three together but was struggling with the final one as she was tired. She asked for help. But, now that she knows she can do it, I expect she’s persist until she is fully independent with buckling. Unbuckling is still challenging for her and I’m okay with that. This entry was posted in Pediatric Stroke Awareness Month 2013 and tagged carseat, independent, Mia, occupational therapy, stroke, Zoe on May 13, 2013 by mara.